What a perfect way to attract and encourage participation in your next company survey! When card recipients call, they participate in the survey and then receive free long distance minutes. In turn, you have an informed potential customer. 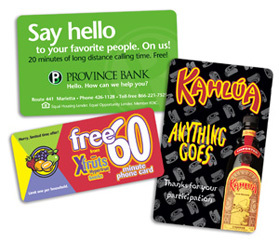 These cards can be printed in a variety of shapes or sizes, in addition to the standard credit card size. Please contact Plastic Works to discuss the many options offered.